It is just pretending. A week ago we got 30 cm of snow and it was -21 c, yesterday it was +9 c and there is water everywhere, including in the large hole in the basement. But the forecast is for more snow. Regarding that large hole… Plumbing isn’t rocket science, friends, we have been doing it since the Romans made hot & cold running water a common thing in bath houses. So how come I have a hole in the basement that will take a good sized body? It seemed a simple thing, get a back flow installed to prevent the sewer from backing up every time we have one of the new, climate change, rainstorms. The thing is a foot long, so why do we need a grave size hole that is now filling up with water? Mostly, it seems because the people who built the house hadn’t a clue what they were doing and they used a honking big clean out trap to connect the inside with the out side. Yes a clean out trap 4 feet underground and running under the wall of the house. I am hoping they don’t need to dig a hole outside the house in front of the only door which is wheelchair accessible, it would mean breaking up concrete and digging through ground which is still frozen. Oh and the water pipe coming into the house sits right on top of the this sewer pipe. Sigh…. On the lighter side I have been knitting a lot because I hurt my back picking mom up off the floor. It made sitting in the studio a pain, literally, so I have been leaning back on hot packs and knitting. 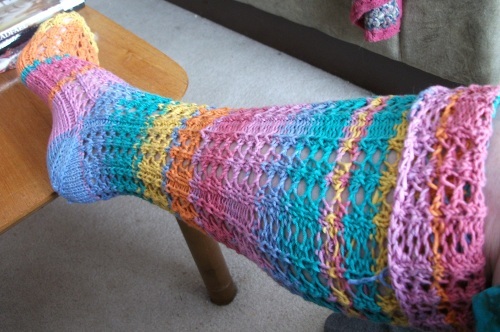 I finished my rainbow stockings. I started a shawl and a sweater for my little dog, Katie. The shawl, Wingspan, has been put on hold until I go to Nova Scotia in May. It will be a perfect travelling project. Details can be seen in the link to my Ravelry project page. I did get into the studio on Saturday and and with the help of some Ibuprofen managed to get a few hours done on Pan. It was mostly sculpting his armpits, which don’t show so I didn’t bother to take pictures.